Sanaa: Yemeni rebels have held a mass funeral for children killed in an explosion near two schools in the war-torn country's capital Sanaa. The explosion in the rebel-held capital killed 14 children and wounded 16 others on Sunday, the UN said. The cause remains unknown. Most of the casualties of the blast in the city's Saewan district were girls under the age of nine, according to the UN. 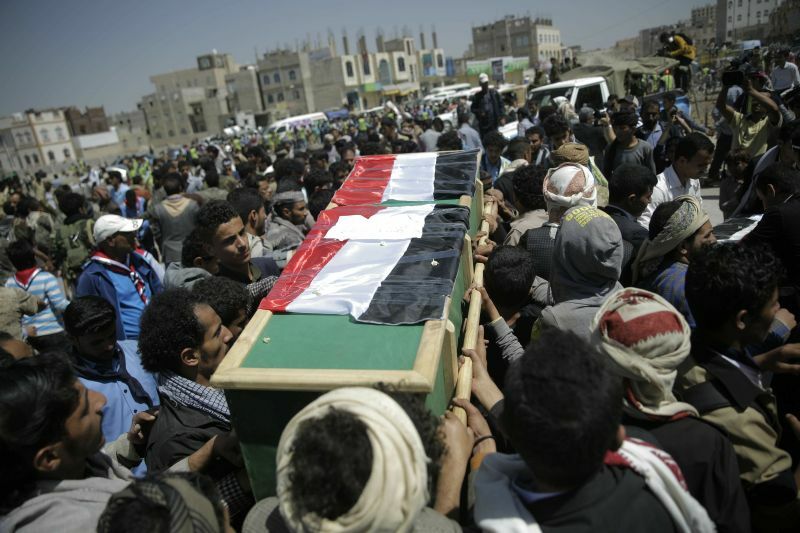 Mourners carry the coffin of a victim of an explosion during a funeral procession in Sanaa, Yemen. The children were buried Wednesday under the watchful eye of Huthi rebels, who have been at war with a pro-government alliance led by Saudi Arabia. 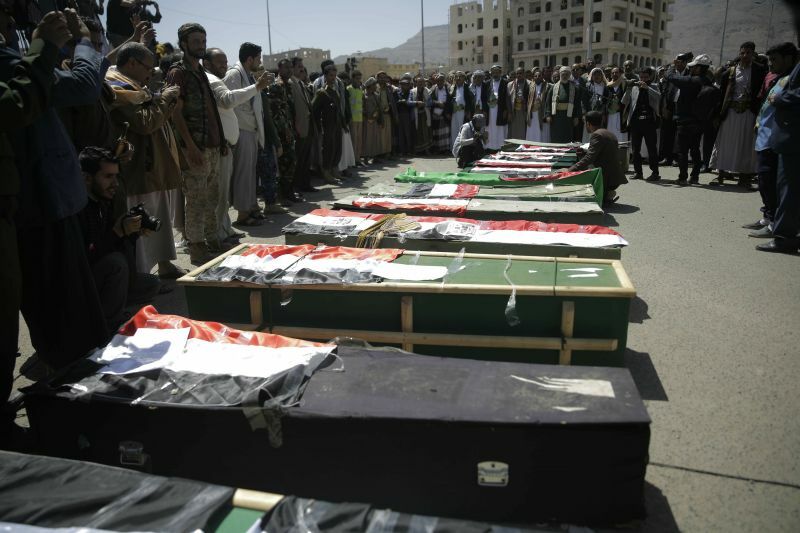 Crowds of men spilled into the streets of the capital where coffins draped with Yemeni flags were lined up. 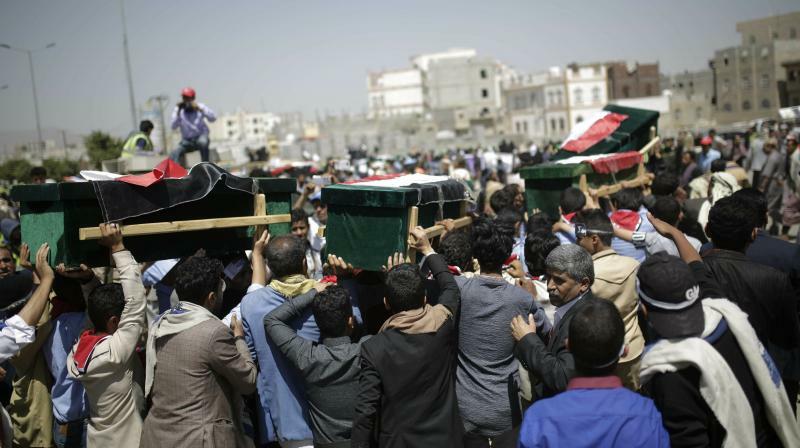 Mourners attend a mass funeral of victims of an explosion during a funeral procession in Sanaa, Yemen. "What sin have they committed?" asked Essam al-Abed, a local Huthi official and funeral organiser. "Their only sin was carrying backpacks and pens to get an education." The Huthi rebels have accused the Saudi-led military coalition backing the government of killing the children in an air strike. The coalition denied conducting any air raids on the capital on Sunday. The United Nations and aid groups have called for an investigation into the explosion but have been unable to determine the cause. The World Health Organization estimates nearly 10,000 Yemenis have been killed since 2015, when Riyadh and its allies intervened to prevent the government's defeat in the face of rebel advances. Human rights groups say the real death toll is several times higher. The conflict has pushed millions of Yemenis to the brink of mass starvation, in what the UN has called the world's worst humanitarian crisis. Both sides stand accused of actions that could amount to war crimes.